Microsoft it so sure that its Windows Phone can beat your current smart phone pants down, it has started a challenge in India to endorse the fact. Microsoft challenges you to see for your self whether your smart phone has what it takes to beat Windows Phone. You will have to perform simple tasks with your phone and Window Phone and if your smart phone wins, Microsoft will hand over Rs.1000.00 to you. Sweet! Like the Samsung did with stare for 60 minutes campaign in Europe for Samsung Galaxy SIV, Microsoft has invited you to for the challenge here in India. The challenge kicked off yesterday from the silicon city, Bangalore, Hyderabad and Chennai. Don't fret if you have missed the June 1 appointment, the challenge will continue till 30th of June 2013. It will be held in six cities of India viz. Bangalore, Chennai, Coimbatore, Delhi, Hyderabad and Mumbai. 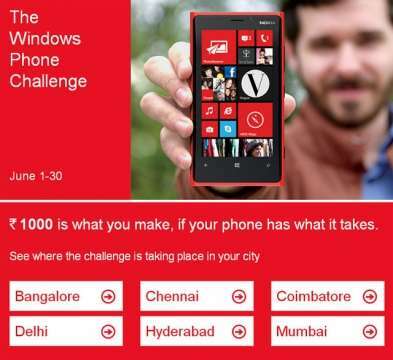 All you have to do is visit the Microsoft's Windows Phone Challenge website, check out for the dates available for your city and visit the Mall listed there in. If you are not winning the 1K with your smart phone, don't be dismayed, Microsoft is offering goodie bags for all those participate in the challenge. It is offering other gifts as well with the purchase of Windows Phone at the places listed in the website. Windows is also promoting the challenge on Twitter using the hashtag #MyNextPhone. You can also follow the challenge on the respective Facebook page for the city you live in. Visit the challenge website here and my wishes to you. Happy hunting and best of luck. I like your blog very very much.Thanks 4 posting. yet this is a great promotional idea ! !